We’re living in a fast-paced world where the underlying challenge modern families are constantly faced with is constant pressure – time pressure, monetary pressure, social pressure, work pressure, the pressure to achieve. At the latest when our children start school, and often even earlier, the pressure to foster our children’s talents adequately challenges us not just to manage, maintain and balance work and family life during school time, but also extends into the rest of the day. In the attempt to organize their children’s afternoon activities or playdates, parents meticulously have to schedule their children’s daily and weekly calendars often at the cost of being time-involved themselves by serving them as a “taxi driver”. And for most of the time everything goes well as long as everybody just “functions” well. We tend to be in a state of “autopilot” until we hit an unforeseen obstacle – may it be the traffic jam, or the person we were meant to hand our children over to not showing up on time, or in the worst case, tiredness or illness strikes us. Our whole time construct may then start to quiver, crumble and fall. And we may feel the stress levels rising, the heart beat increasing, and our mouth getting dry. These are the moments where we finally realize that this is not how we imagined parenthood and raising children to be like – something needs to change. Illustration "Happy Asana" Series by Teresa Heilmann for "It's Buddha Time"
The overriding issue is: How we can make time in our busy days to wind down, reset and recharge in order to start reconnecting with each other again? If this somehow speaks to you, and you are looking for an “emergency exit” out of the frantically spinning hamster wheel Daniela Heidtmann‘s book “It’s Buddha Time” is for you. This book’s stated aim is to build a bridge across to the “island of tranquillity” but without sending you on the road again to another venture, or another date in order to learn how to relax, restore and renew. It doesn’t suggest going on an extensive holiday, nor escaping for a wellness weekend. Instead, it invites the reader to find their “paradise on earth” exactly where they finally happen to have arrived – at their very own home. And it only seems natural to have everybody else in the family join the “adventure of yoga”. With the positive side-effect that along with accompanying our children as they go to bed every night and fall asleep soundly and peacefully, we (the parents) also profit from the same benefits! But what struck me even more as an enormous strength of this book is the fact that Daniela Heidtmann encourages “self practice”, which means practicing under one’s own guidance and probably even more challenging on grounds of one’s own motivation. 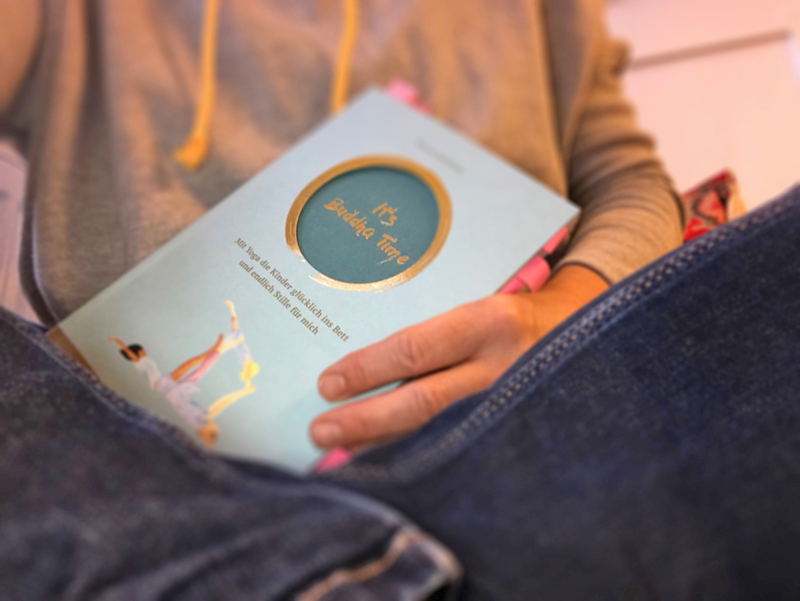 Instead of placing the responsibility to practice into someone else’s hands, Daniela Heidtmann step-by-step provides the reader with everything required for a “personal yoga practice” right at their doorstep! The yoga asanas (yogic postures) she calls “Happy-Asanas” – happy in the sense that they are designed to create a connection from heart to heart. With the intention to nourish our children’s (and our own) souls. And in that sense it’s all about recognizing the present moment. What is needed right now? What mood is my child in right here, right now? What does it need to find rest, peace and calm to sleep happily? Illustration "Happy Asana" Series by Teresa Heilmann for "It's Buddha Time"
For any given mood the book provides the reader with a matching series of asanas. As a result, instead of getting into a rut of always practicing the same, our practice will be manufactured and designed around the needs of our loved ones in order to support them to find their center again. And, even more important, there is no judgement at all. Neither about how our children are in the given present moment, nor about what their practice looks like. All that matters is the process of sharing a practice. Being together in that sacred space of absolute presence. Love. Support. Attention. In Daniela Heidtmann’s own words “Mindfulness” means, “to be totally absorbed in the present moment”. Which includes sensing what the here and now has to offer without judging or criticizing: What does my body feel like right now? How’s my breath? What state is my mind in – centered or all over the place? What are my feelings like? What emotions am I going through? Illustration of the "Family Chaos" by Lara Schnups for "It's Buddha Time"
Whenever you hear the sound of a bell, for example from a church nearby, stop doing what you’re doing, take three deep breaths, and celebrate and acknowledge the present moment. That’s it. Nothing more. And yet, if you come to practice it regularly, you’ll end up relaxing and releasing small amounts of tension in the body at least four (!) times per hour – believe me, soon you will master any rapids, storms, and tempers in your everyday life in an uninterrupted state of mind. But let’s come back to the book: The evening ritual of practicing, or from the children’s perspective “playing yoga” together, is then followed by various ideas of how to relax towards going to bed. This chapter provides nourishment for the soul. I personally love the “Golden Droplet” mindfulness oil massage instructed to nurture the skin and all the different senses. Illustration by Teresa Heilmann for "It's Buddha Time"
Snuggled in their warm beds with eyes closed they listen to the story of “The bed of clouds” which lifts them up and carries them across to the land of their dreams, and finally back home again – sweet memories leading to sweet dreams! And so we continue to sit with the candle still lit completely absorbed in our own practice, maybe only five minutes to begin with, and then continuously increasing the minutes until one day we sit for half an hour – in peace, in quietness letting it all happen …. Illustration "28 Inspiration Cards" by Maren Engel for "It's Buddha Time"
Thank you so much, dear Judith, for providing me with a free review copy of this wonderful, inspiring book! Presently the book is available in German here, but an English version of “It’s Buddha Time” is to follow soon. I’ll keep you informed!